That’s because there is no hero in Prince of Thorns, the protagonist does not seek redemption and in fact, if our protagonist achieves his objective, the whole world will fall under the command of an evil, evil young man. In fact, what made the first book so damned special was that you never knew what Jorg was going to do next, because he had absolutely no conscience, no moral compass. As a reader, you couldn’t rely on restraint, disgust or fear to hold him back. So, I ask the question, readers, what on earth has propelled King of Thorns, the sequel to a book so dark and downright disturbing, to the top of fantasy readers’ most anticipated book lists? What is it about the character of Jorg and the setting of the Broken Empire that has propelled this debut author’s work, according to Amazon’s sales ranks, into the top 10 best selling fantasy books in the world? Before we begin I will offer you a bit of comfort and tell you that it’s probably not because you’re attracted to reading about death and despair (note: I did say probably!). To begin with, being in the first person Prince of Thorns offers us a close relationship to our protagonist, Jorg. We therefore see the world through Jorg’s eyes and everything that we see includes, in some way, a thought, feeling or opinion from him. It is for this reason that we connect with Jorg because, essentially, when we pick up the book we become him. Writers such as Patrick Rothfuss and Douglas Hulick have said that writing in the first person for a great deal of time tends to leave an author stuck thinking in their characters’ voice. I find a very similar effect happening to me, as a reader. If I read a book in the first person, such as Prince of Thorns or Patrick Rothfuss’s Name of the Wind, I’ll find my own thoughts and even word choice resembling the voices of Jorg or Kvothe. Therefore, already, we can see a kind of bond between the reader and the protagonist being formed. There is also the fact that Jorg has the unfair advantage of being able to tell us his story through biased opinion. Now, I should say that Jorg doesn’t take this opportunity very often. Unlike many protagonists he doesn’t ‘whine’ at the reader and tell them life is unfair. Rather, he sees life as a game and will often lighten up a terrible scene with a clever quip, such as: “Few things worth having can be got easily” or “Water! Water! It’s always water with the dying. Strange, it’s killing that gives me a thirst.” You quickly find yourself smiling or nodding along to Jorg’s way of thinking. The darkness is still there, but you accept it because he delivers it so elegantly, so amusingly and with such matter of factness. The following revelation is often the most shocking to readers when they begin to reflect upon the book and, initially, may even deny it was the case until they think about it (so – think about it before denying it, reader!). As the book progresses and we begin to understand Jorg, we begin, dare I say it, to feel empathy towards him. Here is a prince that was set to one day be a king until his mother was torn away from him, raped and killed alongside his baby brother. Worst of all, he was forced to watch their deaths and expected to just forget about them. Can we blame him for not letting that experience go? Can we blame him for wanting some kind of revenge? Can we blame him for not wanting the people he sees as responsible for this atrocity sitting on the throne? (Note: perhaps skip the remainder of this paragraph if you’ve not read the first book). I don’t think Jorg will trust a family member ever again. After having found out that his uncle and father had an understanding about and involvement in his mother’s death – how could he? The result is that you find yourself asking: does this young man who was forced, as a child, to watch his mother killed and raped deserve a shot at redemption? Is anyone ever so bad that we have to write them off forever? Would Jorg even accept redemption if it was offered to him? Perhaps we don’t think he does deserve it, but should his father and uncle be allowed to get away with their part in his mother’s and brother’s murders? If you don’t think they should, then you need to realise that, in the Broken Empire, if Jorg doesn’t do something no one else will. What I find myself asking when reading Prince of Thorns is: if I was in Jorg’s position and in Jorg’s world, how would I have grown up? 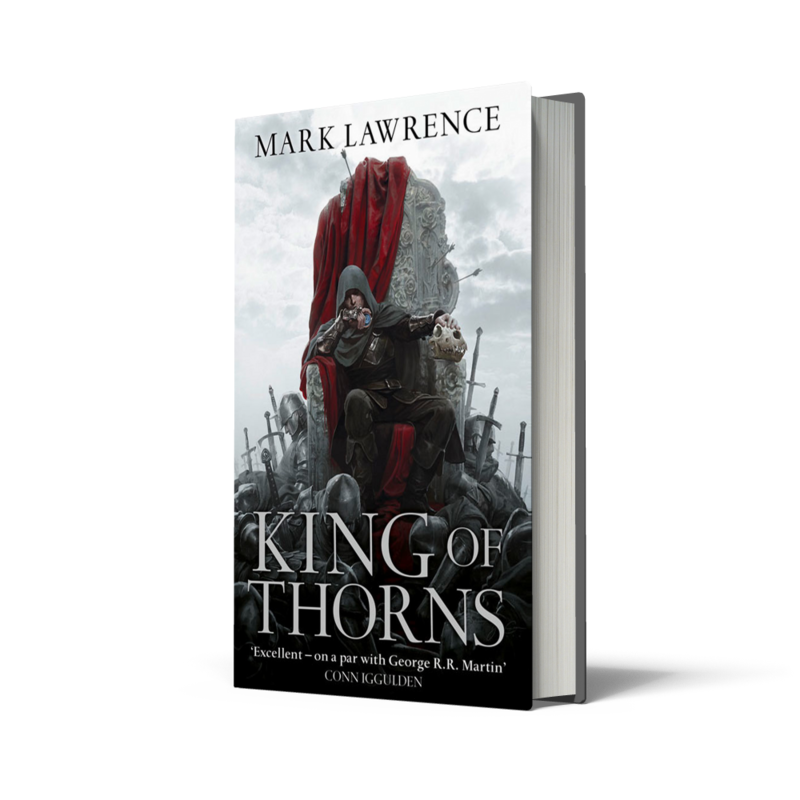 Prince of Thorns is available now from all good book shops.